The PM15 EasyAir has a powerful 1/5 horsepower high performance compressor delivers a minimum of 13 L/min at 50 psi. It's Easy to Use. The PM15F EasyAir eliminates the need for pressure/flow calculations with a built-in flow gauge. 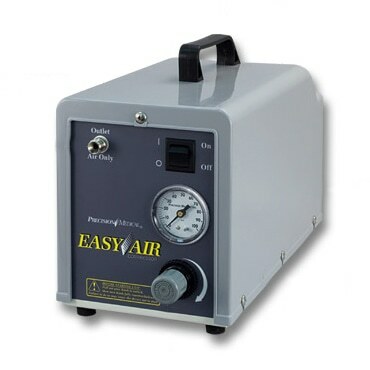 The PM15P EasyAir is available with a standard pressure gauge. All come with non-marring feet. It's Lightweight. The PM15 EasyAir is 22% lighter than compatible compressors. It weighs only 20.4 lbs making it much easier to carry. It's Safe. Safety is assured with the automatic resetting thermal limit switch which protects the unit from overheating.